Calling all volunteers and Cahaba lovers: don’t litter–it winds up in your River! Reuse, Reduce Waste, Recycle! Cahaba River Society is launching the largest Cahaba River cleanup ever! We will clean up to 50 miles of the Cahaba River from Trussville to Helena in one day. The largest 1-day Cahaba River Cleanup will cover up to 50 miles of the Cahaba River – Alabama’s longest remaining free-flowing river and the “biological heart” of American’s Amazon. To restore natural beauty and reduce pollution of this iconic river (and a primary source of Birmingham’s drinking water) while educating the public about reducing litter and encouraging recycling. Saturday, June 8, 2019. Registration at 8 a.m. at designated sites. Shuttles run between 8-9a.m. between sites and Cleanup begins at 9 a.m.
Up to 50 miles of the Cahaba River in up to 7 stretches from Trussville to Helena. Cahaba River Society, volunteers, community and corporate sponsors and partners. With your help! This event would not be possible without the generosity of supporters like you. Since our beginnings, Cahaba River Society has led volunteers in cleaning up areas of the River. 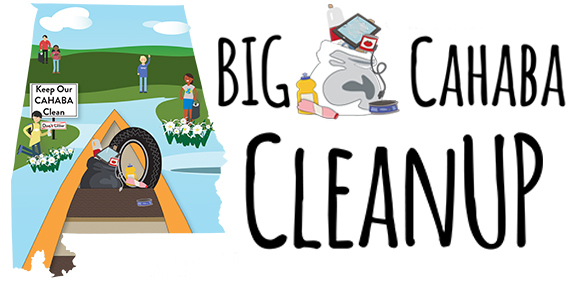 The Big Cahaba Cleanup will condense and amplify the efforts and impacts of volunteers through a one-day project engaging people from Cahaba communities across all sectors, offering opportunities for corporate partners, civic and faith groups, local governments, and individuals to make an impact in cleaning up the Cahaba River.